BTS lit up the red carpet at the 61st Annual Grammy Awards, which took place at the STAPLES Center in Los Angeles on Feb. 10. The South Korean boyband looked dashing, as they arrived at the awards. They were all dressed in matching black-and-white tuxes and were full of smiles soaking up the special moment. In other huge news, RM confirmed BTS is working really hard on their next album, which will focus on “paying off” to their fans. He played coy again though, when asked if the album would kick off another trilogy. He said, “That’s a secret” and then laughed. In another red carpet interview which was posted on the Recording Academy/Grammys YouTube channel, RM teased the album would be coming “sooner rather than later” and the artists they were most excited to see included Lady Gaga, H.E.R. and Camila Cabello. BTS was nominated for their first-ever Grammy Award for Best Recording Package for Love Yourself: Tear. They didn’t win the award though, it went to St. Vincent for her album Masseduction. In at least one camera pan to BTS in their seats in the audience, RM, Jimin, J-Hope, V, Jin, Jungkook and Suga could be seen singing and getting into the Dolly Parton MusiCares tribute performance when Parton was singing “Jolene” along with Miley Cyrus. Hmmm...does this mean the new BTS album feature a country music collab artist? 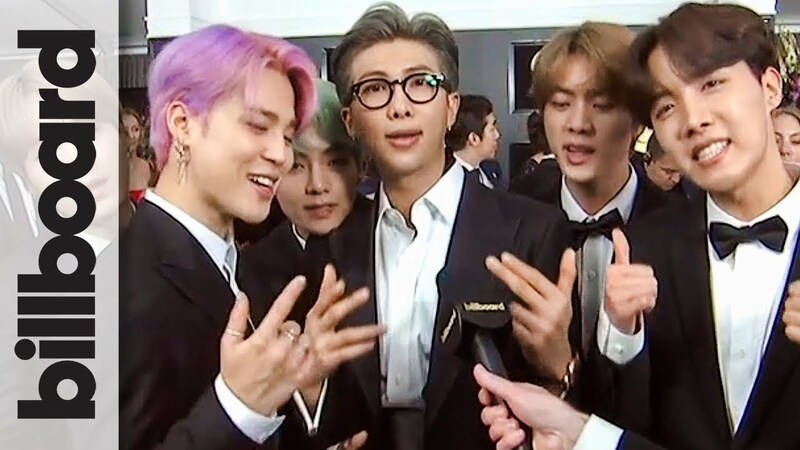 Watch the BTS Grammys 2019 red carpet videos above and below and stay tuned to AXS for more on BTS.